The New England Medical and Surgical Center is located at 15 Members Way, Dover NH 03820. Take Route 16 (Spaulding Turnpike) towards Dover NH. Take Exit 9 and turn left onto Indian Brook Drive. Turn right onto Members Way (just past Northeast Credit Union). Go straight at the 4-way stop sign. Follow signs to OFFICE in order to check-in. Show quality two horse bumper pull aluminum trailer. Spacious tack/dressing room with wall mount saddle racks. Swinging stall divider, spring loaded ramp, double side exit doors, fully matted, Warmblood size/height. $120 Day/$600 week - rental fee accepted in cash only. Must provide proof of license & vehicle insurance and $500 refunded damage deposit. Optional night before pick up, given availability. Contact for livestock hauling also. call or text: 575-519-9220, thanks! 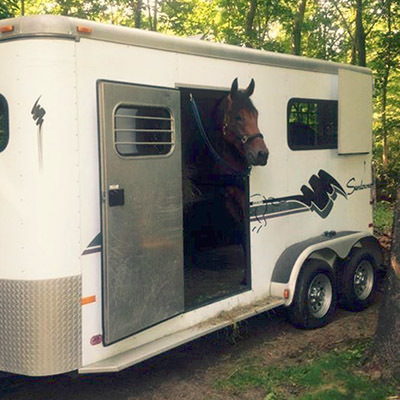 Equine transport, shipping, farm animals!